So here’s the heart of this story. BrightLeaf Homes is a new kind of residential builder, a conscientious one. Dream team Rick Thompson, Alex Thompson, and Scott Sanders had a couple things in common. All three had spent years in the building industry, acquiring the experience and knowledge to become experts in their field. And they all give a damn about people and this place where we live called Earth. Here’s something near and dear to their hearts: residential buildings consume the third-highest amount of energy, following the industrial and transportation sectors. Rick, Alex, and Scott knew they could do better. They knew they could build a better house, a better home. They believed they could disrupt the system, challenge the old, stand up for the new, blaze new trails, and most importantly - show up. And so they did. Since 2008, BrightLeaf Homes has been building sustainable, long-lasting homes in the Chicago metro that focus on energy conservation and conscientiousness. Homes that are built to fit the people who live in them. There’s nothing quite like a worthy cause to get people passionate and working hard towards a common goal. The BrightLeaf team had that in abundance. What they didn’t have was the time or tools necessary to bring in the leads they were hoping to achieve. At the time they started working with us, their website was outdated and wasn't representing the high-tech, modern product that BrightLeaf brought to the market. What Brightleaf needed was a website that would work as their #4 guy. A tool that would work as a 24/7 salesperson. A resource to help educate their prospects to a point closer to conversion. Something that visually represented their mission and beliefs. Their 'why'. Their old website was an online brochure. A collection of words. They needed something that connected with their personas. They needed to show people what it meant to own a BrightLeaf home. It goes beyond words and into a realm of feelings and imagery. Yes, we should talk about the website. But first, we need to talk about the soul of the website, the brand. When we began this journey with the BrightLeaf team, we quickly realized their needs went beyond a website update. They needed the right colors, words, and imagery to communicate their mission and vision. What was on their current site was a humdrum grasp of their driving values. It did little to differentiate themselves from other green builders, and even less to exemplify their unique, ultra-modern building approach. 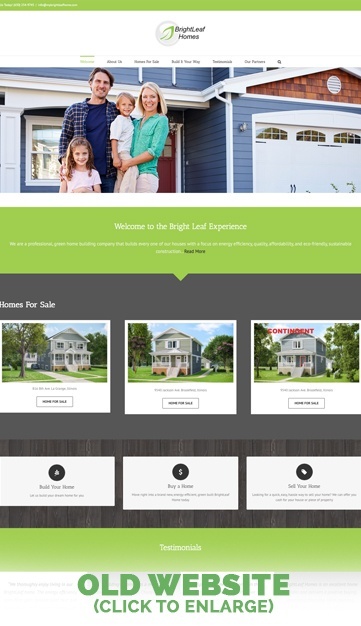 We knew we could turn the website on its head and run a massive inbound marketing campaign, but at the end of the day, the persona’s first impression of the brand would have a huge impact on their overall opinion of BrightLeaf Homes. So we needed that first impression to be a good one. The brand renewal involved all the good stuff any brand renewal should. Persona research, competitor research, a study in color, an in-depth analysis of BrightLeaf Homes as a business and a movement. Perhaps most importantly, however, it involved some deep thought on the mission and values that Rick, Alex, and Scott had built the company upon. The words were there, just unsaid and unformulated. 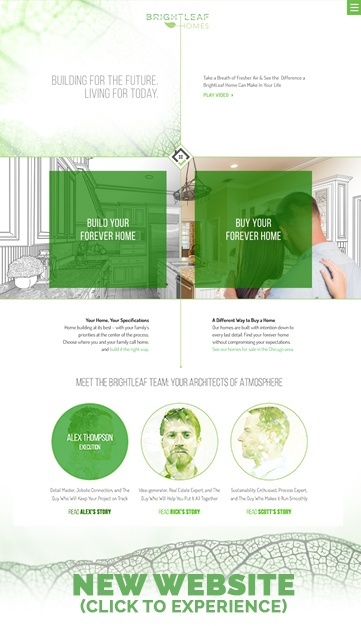 Our challenge was to gather up the information and create a cohesive brand that connects with the target persona and truly represents BrightLeaf Homes. So we did. Armed with a kickass brand and a passionate team (both ours and theirs), we embarked on the website voyage. 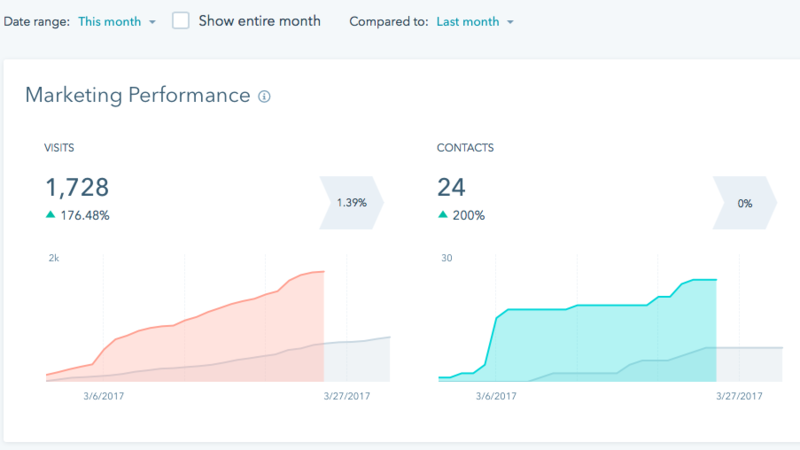 One of the main reasons the BrightLeaf team sought us out in the first place was the extensive information on our website about Inbound Marketing and Growth Driven Design. Providing valuable content on the website as a way to educate users, and developing content to help lead users through their buyer’s journey was hugely attractive to the client. This, in combination with the ever-evolving continuous improvement approach Growth Driven Design Methodology offers, helped set the direction we took in this website revival. We started with a discovery meeting. A deep dive into their current website needs and wishes. This also included a detailed look at their targeted personas, an audit of their current website, and their overall business goals. We took that valuable information and let it lead the GDD strategy. Approaching the website from a user standpoint, rather than the preferences of the people involved in developing the strategy, was of the utmost importance. We conducted in-depth user interviews, developed persona fundamental assumptions, and crafted the ideal user journey through the website to help lead the site map foundation. Based on the client’s aggressive business goals, we recognized the need for custom graphics and content on 14 high impact pages, as well as several other template pages for the rest of the website. With a tight timeline of 40 days from site map creation all the way to a developed and launched website, we had the hustle to make this happen. 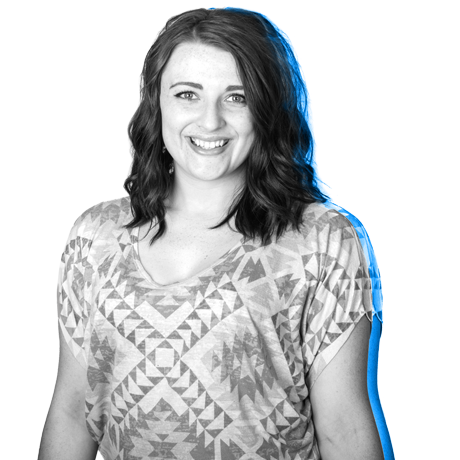 Per our process, we split the content creation into two phases to speed up turnaround time and client approval. It was quickly determined that building the website on the HubSpot COS platform would offer the most value to the client in the long run. The flexible stage and seamless integration with HubSpot’s marketing software enabled us to launch the website quickly and positioned the website for success ongoing. Once launched, we immediately began the continuous improvement phase of GDD by benchmarking current elements so we could come back and tweak as needed for ultimate success. EXPERIENCE THE WEBSITE IN ALL ITS GLORY HERE! As you can see, the visits and leads began to ramp up in December. 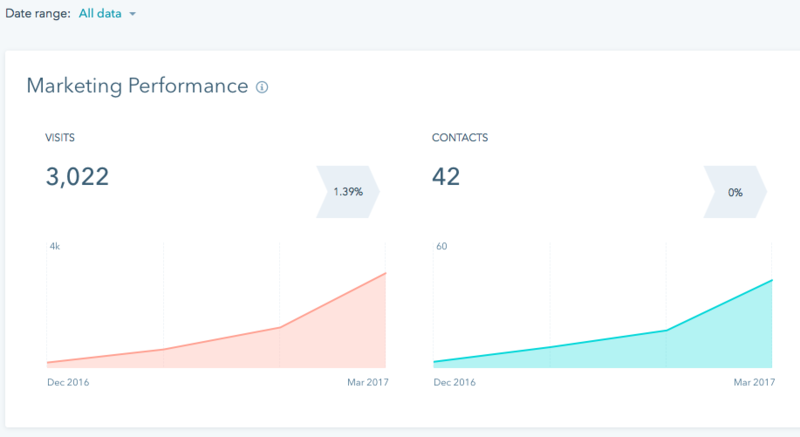 Prior to the website revival efforts in mid-January, we had already been implementing inbound efforts throughout the website in the form of landing pages and CTAs. 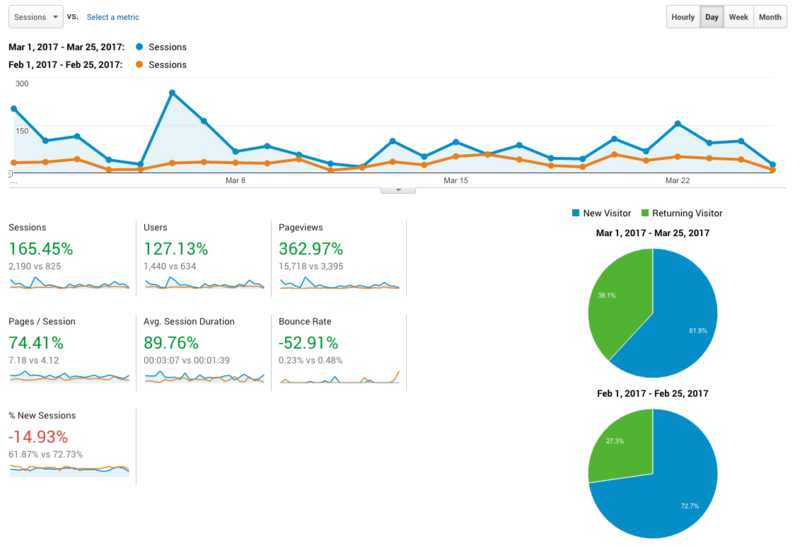 You can clearly see the dramatic jump in both visits and leads at the beginning of March. March numbers compared to February numbers highlight the jump in greater detail. 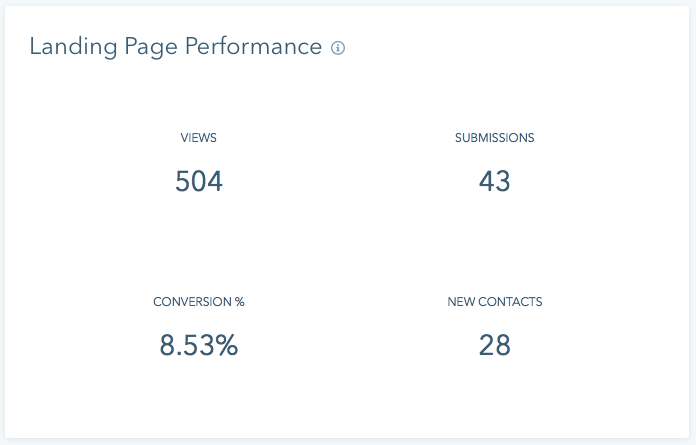 The landing pages have shown remarkable results in a short period of time, emphasizing the importance of the content and visuals on these pages. To drill into the data, we took a direct comparison of Feb 1-25 vs. March 1-25. On almost all accounts, the website performance has improved. The content and design have clearly had an impact, as depicted in the drop in bounce rate, the increase in time on page, and the overall pages viewed per session. We’re successfully engaging the user throughout the website, and giving them the right content at the right time.